As belts tighten, organic produce may be something a lot of people will sacrifice for price. I did a quick tot up of the fruit and veg in the box and think I would have actually spent a little more in the supermarket. This was mainly due to the big bag of broad beans which were £2.99 for less on my last look. Them Apples blog did a really good price comparison which was interesting and showed a negligible difference between the two. Very surprising. The quality of produce was really good. Just the lettuce looked a little sad and wilted, but it was the first thing to be eaten and was delicious, although I don't think it would have lasted longer than another day. So how was it all used up? 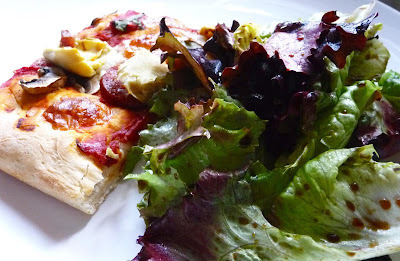 The lettuce was served alongside Mr. GF's legendary homemade pizza. 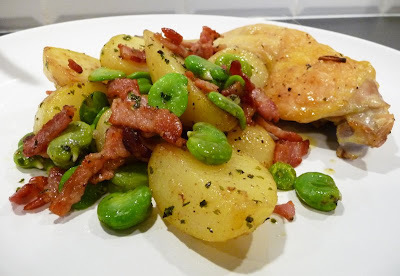 Broad beans were used in a warm salad with the Jersey potatoes and bacon, served with roasted chicken. 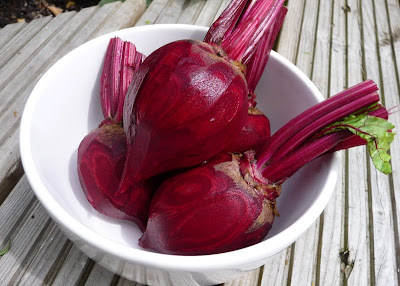 Beetroot was made into a shocking coloured slaw alongside some of the carrots, apples and spring onions and served with duck. 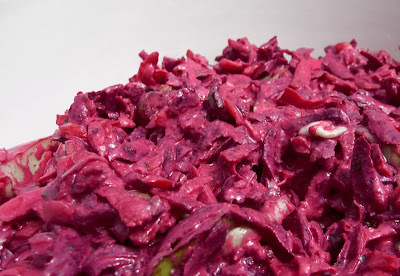 I did some peasant-style side dishes with the cabbage and the beetroot tops. 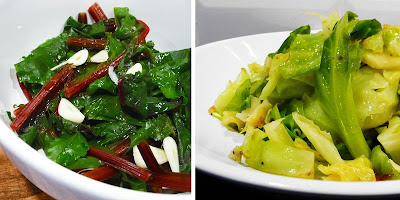 I have a separate post in the pipeline for this amazing, traditional Italian method of serving up your greens. Life changing, no lie. Fruit was taken to work and eaten as snacks and any remaining veg was used up in a soup at the end of the week. Overall I would say this was good value for money and creates a bit of excitement as you peer in to see what's in the box. It was a great amount of veg for one person but it did feed two of us almost the whole week with only a couple of additional vegetables. The slaw I made was for 5 people so quite a lot of carrots and all of the beetroot went in there, but would have done another meal. I like their ethos, the attention to detail and the recipe ideas on their beautifully designed website if you are stuck on what to do with a certain item. Most importantly, boxes can be tailored to your own preferences so cabbage haters can breathe easy. I must say, shopping for food is an event I really enjoy in my sad little life. I love literally cherry-picking cherries and spending an age sniffing melons for the best one to the pains of other shoppers behind me. But I do think it is a super idea for those unable to easily reach good produce through working times or location, don't have cars to carry heavy items or who just prefer the convenience of having their food delivered. Delivery isn't a big deal at just 99p and their website will sometimes have offers and discounts worth checking out. Their range is also expanding and includes seasonal ranges, meat, dairy, store cupboard produce, drinks, selected prepared foods and even eco cleaning products too.